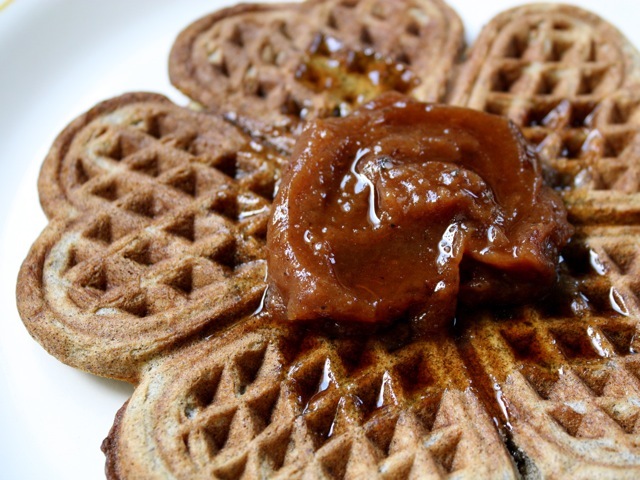 Based on the standard waffle recipe in the Joy of Cooking, this is a good recipe for those autumn mornings when you feel like making Deborah Madison's yeasted buckwheat waffles but have forgotten to start the yeast batter the night before. If you're not feeding a crowd, cut the recipe in half. In a large bowl, whisk together the eggs, then add the rest of the liquid ingredients. Add the dry ingredients to the wet and carefully mix together. Add the grated apple. Cook on a preheated waffle iron (oiled if necessary) until all the batter is gone. Keep cooked waffles warm in a preheated 200-degree oven. Serve with apple butter and warm maple syrup. If you have extra egg whites on hand, add them to the batter; they'll provide more loft to the cooked waffles. If you feel like it, whip the egg whites and add them to the batter last, folding them in gently. If you use only buttermilk or kefir, you may need to add a splash of milk to thin the batter slightly.